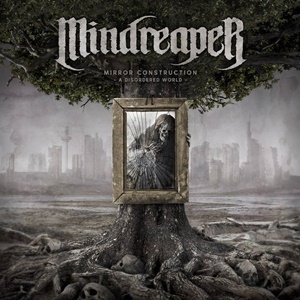 Enriching the underground since 2001, Mindreaper come from the fertile mecca of metal in Europe – otherwise known as Germany. They’ve slowly worked their way up through demos, EP, and full-length album releases – setting the stage for this second full-length, Mirror Construction (…A Disordered World). Given it’s this writer’s first exposure to the group, they’ve got a mix of thrash/death influences that at times comes across quite melodic while never relinquishing the brutality and heaviness necessary to convince the masses into these styles. The game plan seems fairly straightforward – inject this material with a solid set of riff mechanics, enhance the proceedings through discernible growls and steady double bass rhythm section support and you get an evil thrash/death combination that underground hordes clamor for. Especially when you hear the tribal-like rhythmic vocal patterns, low-tuned circular guitar chug, and steady snare/double bass action for “Stillborn God” that makes you think of everything from 90’s Sepultura to a pinch of Obituary. The high guitar melodies for sections of “Purity of Wrath” take things back to early Swedish melodic death territory, although the vocals of Sebastian Rehbein (nicknamed ‘Sucking’ – no clue on that moniker) possess the necessary raspy growl to keep things pure and on point, without commercial aspirations. The lead play is exemplary – Michael Amott and his contemporaries would be proud to hear their influence on “Passage to Extinction” as well as “New Age Tyranny”. The only awkward portion of the record comes out in the quieter, melodic start to “Story of Rejection” – the restrained, reflective acoustic opening and proper cultural drum tempo is offset by the natural Sebastian growls where possibly a guest melodic/clean or narrative spot would have served the song better, as otherwise the folk/epic electric musical content makes this a standout to the good. Andy Classen at Stage One Studio (Krisiun, Tankard) handled the production duties, giving Mindreaper the right aggressive balance for their thrash/death style to shine. This record is for those who dig both genres, but also dig deep within the underground to gain that raw, unfiltered edge to the performances and songwriting.